Here at ChiIL Mama and ChiIL Live Shows, we've been promoting THE ILLUSIONISTS since they first announced their Chicago run last July! FINALLY opening night is drawing near, this Thursday, March 12th in fact. Got your tickets yet?! Don't miss THIS! ChiIL Mama and the kids will be there celebrating my son Dugan's 14th birthday. 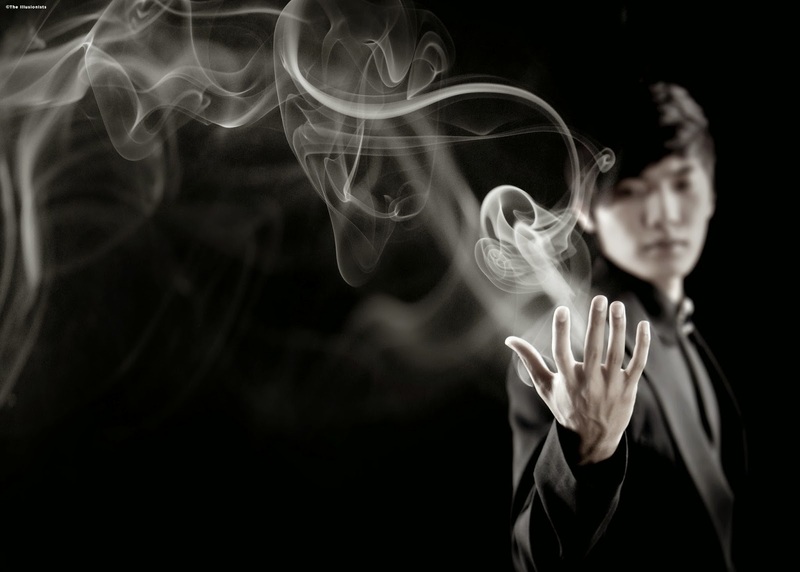 It's going to be one rockin' awesome magic show! 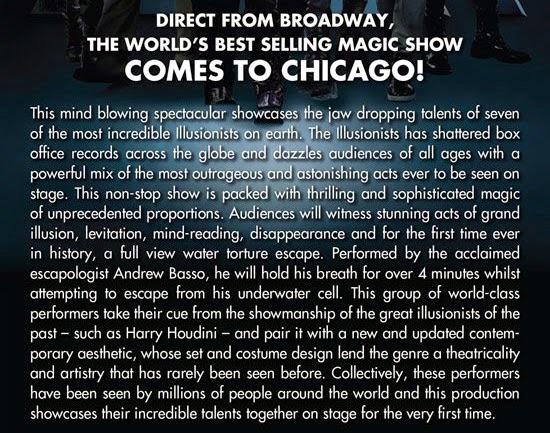 Broadway In Chicago is thrilled to announce that direct from Broadway, THE ILLUSIONISTS - WITNESS THE IMPOSSIBLE™, the world’s best-selling touring magic show, will play the Cadillac Palace Theatre (151 W Randolph) for a two-week limited engagement March 10 – 22, 2015. 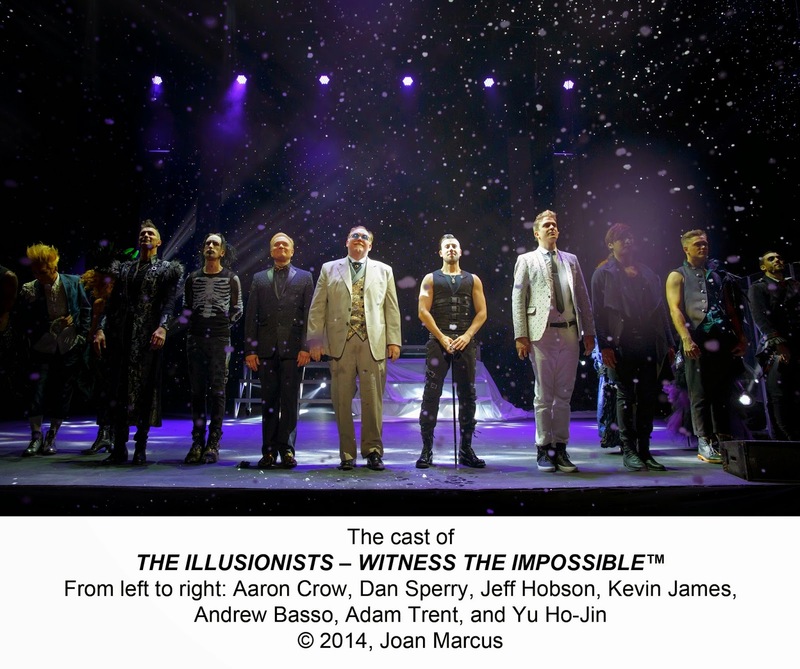 THE ILLUSIONISTS - WITNESS THE IMPOSSIBLE™ is produced by Simon Painter, Tim Lawson and MagicSpace Entertainment. 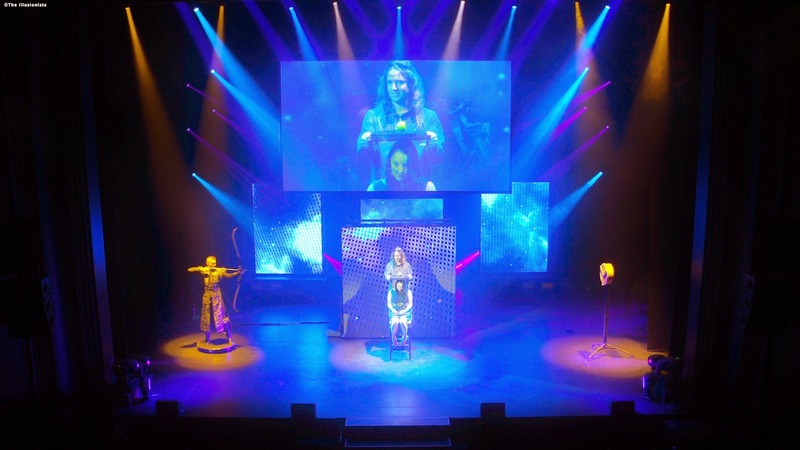 Conceived by Simon Painter, the show’s creative team also includes executive producer Tim Lawson, director Neil Dorward and creative director Jim Millan. For additional show information, please visit www.BroadwayInChicago.com or http://www.theillusionistslive.com/. 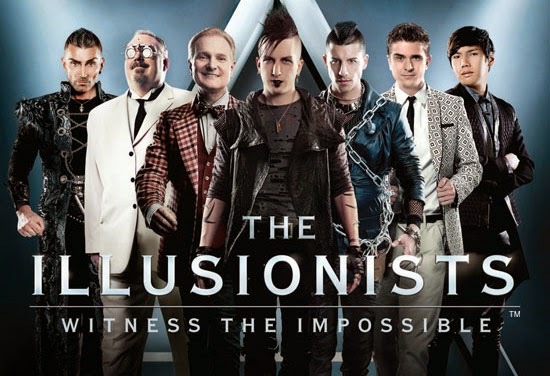 Individual tickets for THE ILLUSIONISTS - WITNESS THE IMPOSSIBLE™ at the Cadillac Palace Theatre range from $16-$80. A select number of premium seats are also available for many performances. Tickets are available at all Broadway In Chicago Box Offices (24 W. Randolph St., 151 W. Randolph St., 18 W. Monroe St. and 175 E. Chestnut), the Broadway In Chicago Ticket Line at (800) 775-2000, all Ticketmaster retail locations and online at www.BroadwayInChicago.com.